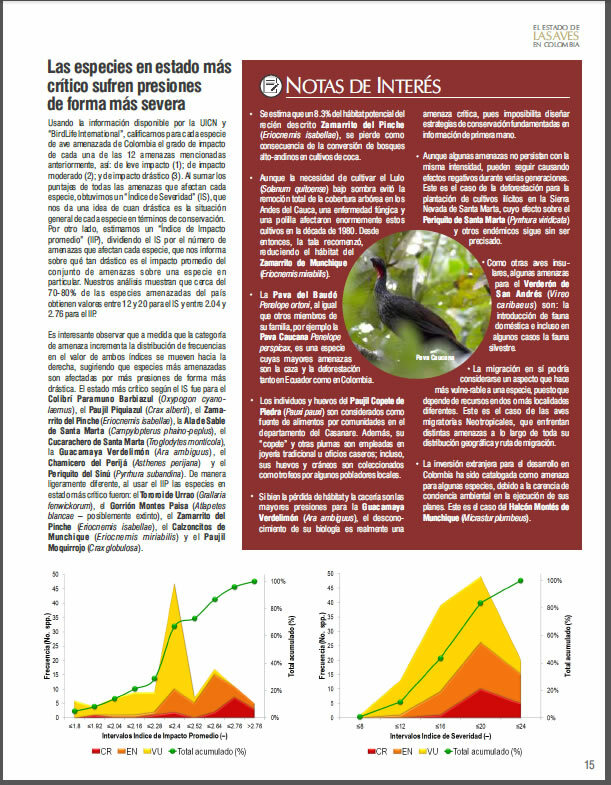 A National Alert: a new report highlights the dire situation for birds in Colombia. Thanks to hundreds of researchers a new publication highlights the serious problems facing birds in Colombia – establishing a barometer for the state of the environment in this, the richest country for birds on earth. For the first time, “The State of the Birds of Colombia” evaluates the status and priorities for the conservation of Colombian birds. Unfortunately the situation of birds in Colombia is deteriorating rapidly in recent decades, and as “canaries in the coal mine” birds provide an important warning about threats to our water, air, natural resources in Colombia is shown. Birds are critical indicators of the overall health of our environment. Like the canaries in the coal mine, they provide an early warning system about threats to our water, air, natural resources, climate and much more. The ProAves team brought together decades of data from the IUCN Red List along with information to identify the trends of our most threatened bird populations – and to highlight species, sites and habitats at greatest risk. 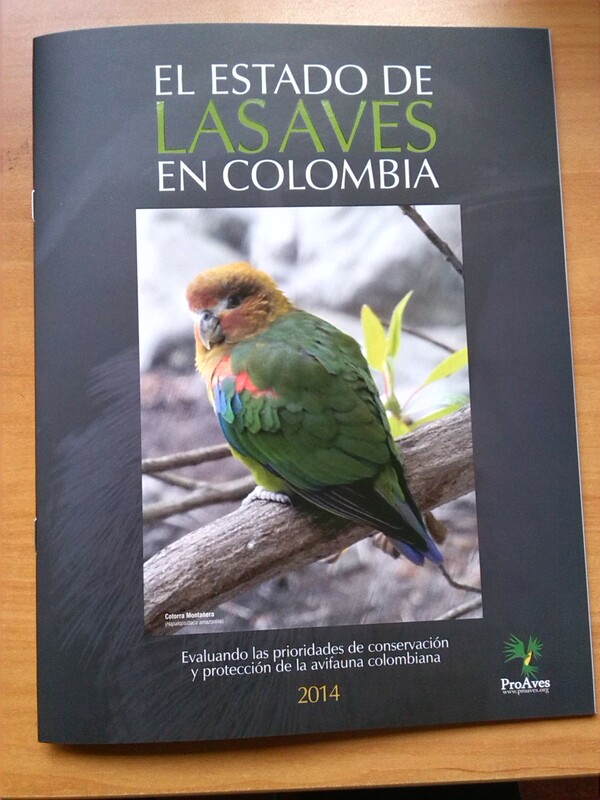 Posted by ProAves, who focuses on concrete conservation actions throughout Colombia, is undoubtedly one of the most important documents published in Colombia recently is published consultation provides important data regarding the current situation of our species threatened bird species in Colombia, this work is primarily an alert to all and an effective tool for making conservation decisions. In Colombia have been advanced reviews by species of Colombian avifauna thanks to the red books of several international and national institutions, However this new publication outlines a benchmark for identifying priorities in management ecosystems and protected areas where endangered bird species in Colombia are concentrated. This report establishes an annual baseline by which to monitor birds across Colombia in order to efficiently and effectively direct conservation actions by government agencies, non-governmental organizations, and local communities across Colombia. 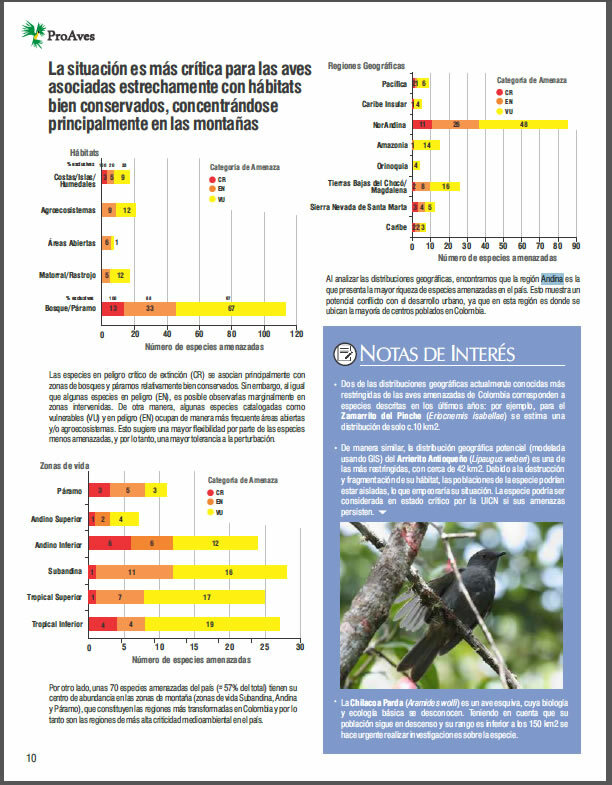 The document is divided into four sections, the first: The State of birds in Colombia where is summarized the current situation of Colombian birds according to IUCN Red List and Birdlife International. 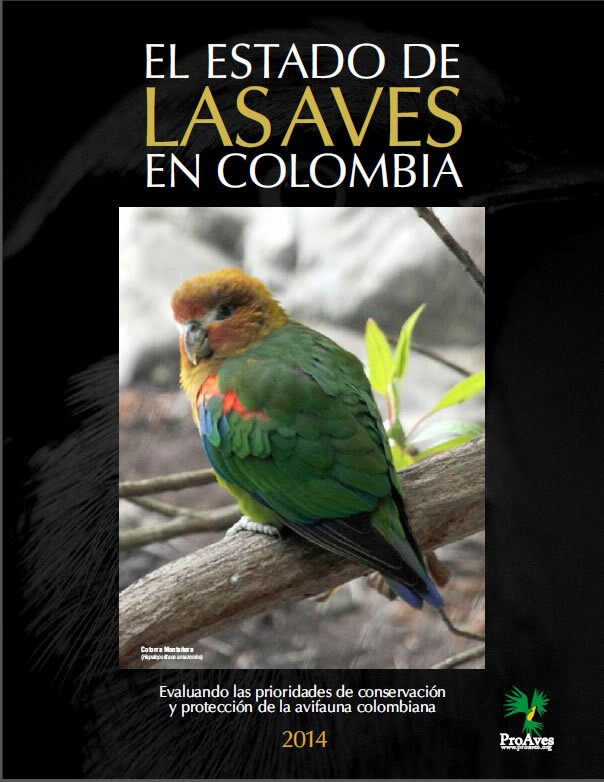 The second section identifies and describes the main threats that are detrimental to the populations of Colombian birds. The third section presents an analysis of lost and threatened species in different geographic regions of Colombia. Finally the report concludes with Actions and perspectives on major conservation actions undertaken in the last 10 years in the country. Colombiais the countrywith the greatest wealthof birds with1903species, unfortunatelyjust over 6% (122 species) are threatened withextinction. About 40% of birds underthreat categoriesare endemic toColombia. For various reasons, humans are the causeof mostthreatsfacingbirdsinColombia. Conservation actionsmust be based onscientific knowledgeof high quality. The NationalSystem of ProtectedAreas (SINAP) protects most speciesunder the lowest threat category (Vulnerable) whilst ProAves network of private reserves protects most species under higher threat categories (Endangered and Critically Endangered) . The report highlights the ten most endangered birds in Colombia. All are Critically Endangered with a high probability of going extinct within ten years. Five of the ten species are dependent on the fragile páramo ecosystem that provide vital year-round water resources for millions of Colombians living in the Andes. The gravest situation occurs in the highest elevations of the Sierra Nevada de Santa Marta, within the Sierra Nevada National Park, where uncontrolled burning and cattle grazing has extensively damaged this sensitive paramo ecosystem and threatens the survival of three Critically Endangered species. 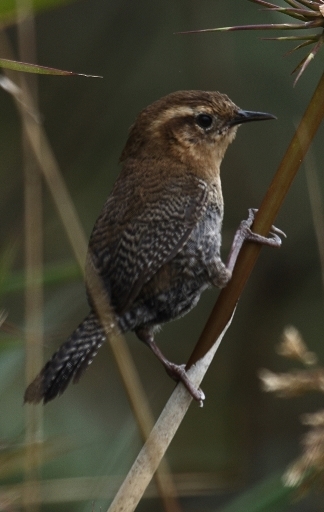 10) Urrao Antpitta (Grallaria fenwickorum) – northwestern Antioquia. ProAves wishes to acknowledge the contributions of hundreds of employees and volunteers who generously donated their time and expertise to ProAves’ research programs across Colombia for over 15 years and the many professionals working for various government agencies (including 15 regional corporations) and non-governmental organizations in Colombia and the world who helped create, enhance and analyze the data taken as a base to produce this first barometer for Colombia.